Google 'My Business' Listing OR Google Places? Google ‘My Business’ Listing OR Google Places? What are they? and How can you get in the game? If you’re wondering how to add your business to Google and get it placed on Google Maps, you’ve come to the right place. But first, let me make an important distinction. I’m not talking about getting your site listed in the Google organic results. (For that, you might want to check out my Search Engine Marketing Guide.) In this post, I’m talking about the local business listings in the Google search results. 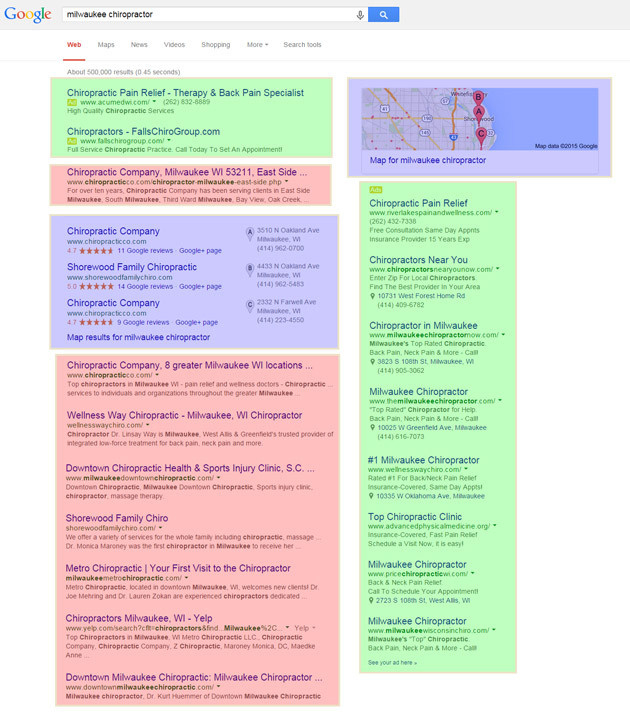 If you were to search Google today for “Milwaukee Chiropractor”, you would see ads (green below), organic listings that Google deems most relevant (red), and the local business listings and map (blue). As you can see, the local listings own some major real estate in the search results pages when a location is included in the search phrase or for searches like “restaurant” or “gas station” where Google is smart enough to know you’re looking for a local business. I’m glad you asked because that’s what this post is about. For step by step instructions, watch my video above. Go to Google.com/business and click on Get On Google or whatever button is there to get started. Search for your business by the address to see if it’s already listed. If it’s listed already, you can claim the listing. If your business is not yet listed, you can go to the next step and add your business information. After a few more questions, Google will ask to verify your business. 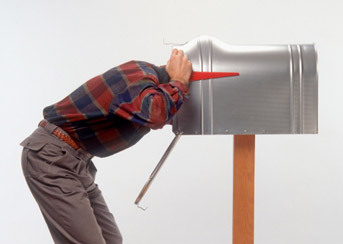 They usually do this by sending a post card to the business address. The postcard will have a verification pin that you will enter to verify your business with Google. Once you receive the code and verify your listing, your Google business listing should start showing up in Google search results within 24-48 hrs. You can then login to your Google My Business account and complete your profile by adding business hours, phone number, pictures, text intro, and whatever fun stuff Google adds to the My Business profile in the future. Developing a complete profile and accumulating reviews over time should help your business listing rank higher in the results. What Happened to Google Places for Business? Did I mention Google likes to change things? The Google business listings were called Google Places for several years and in 2014, Google introduced “Google My Business.” It’s essentially the same, but there are changes and the entire process of getting a listing has been streamlined. Regardless of what the name is at any given time, you can get to the Google Business Listings by going to Google.com/business. What If I Don’t Get The Google Verification Postcard? Good question – this happened to me as you can see in the video above. We requested the post card twice for my client, but it was never received, got thrown out, lost in the mail, or eaten by a dog (not sure). But after 3 months went by and we hadn’t received anything, I decided to get some help. I logged into the Google My Business account and after some clicking around in the help section, I was able to Request a phone call from a specialist. They called me immediately on the phone and the business listing was verified manually in about 10 minutes. The specialist had to call the business owner to verify that I was authorized to act on their behalf before she completed the verification for me. So your best bet if you haven’t received the post card from Google is to give them a call. Make sure to do it through your My Business account so you get the right Google specialist. Got Your Google Business Listing Yet? Have you claimed your listing yet? Post below to ask questions or share your experience with the process.